Royce Mathew, Heather McLeod and Adam Kraft are Edmonton-based singer-songwriters and multi-instrumentalists. With influences ranging from classic rock, country, blues and folk, each musician channels their passion into their art to produce truly thoughtful and inspiring music. They're no strangers to the Edmonton music scene: all three have been playing and performing as solo artists or with groups for years, and Royce has already released an EP with a full-length album on the way. Royce, Heather and Adam are also members of the The Leaky Shack Travelling Road Show, a lively folk-rock band with a debut EP set for release in spring 2018. 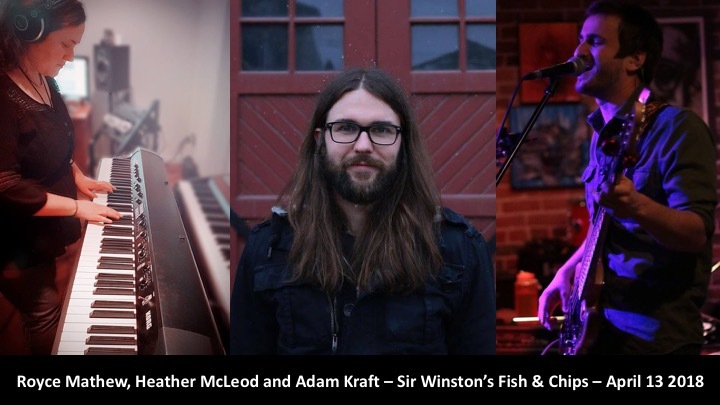 Join them at Sir Winston's for an intimate and exciting evening of music - both original compositions and familiar covers alike!